Now these are poems I could get into, says my partner, who’s been reading Michael Dennis’s latest collection while I’ve been making dinner. They’re direct, easy to understand, emotional, she continues. They make me feel something, but it’s something good—they don’t make me feel stupid, which is a huge relief. My partner does not read poetry. Ever. Her only encounters with verse are at readings, which she attends purely out of kindness, or with my own weird and hunchbacked monsters, which sometimes make her laugh. Although she’s leafing through the pages of Dennis’s book more out of boredom than curiosity, her reaction to the poems comes as a pleasant, but not altogether unexpected, surprise. She’s right—“direct, easy to understand, emotional” is an adequate way to describe the work of a poet known for a sort of blue-collar immediacy, a spoken diction that could pass the colloquial “bar test” of verse (i.e., you could recite a Dennis poem in a pub to a stranger and not get your teeth knocked out). Coming Ashore on Fire, his recent collection from the newborn Burnt Wine Press, adds to a lengthy list of titles from one of Ottawa’s most published and yet most overlooked poets, carrying on the linguistically unadorned but emotionally urgent vein he’s been mining for over 25 years. For its sheer readability, I have the small hope that Dennis’s work might operate as a gateway drug for my partner; that dipping into his book might somehow lead to more head-spinning, confusing stuff. 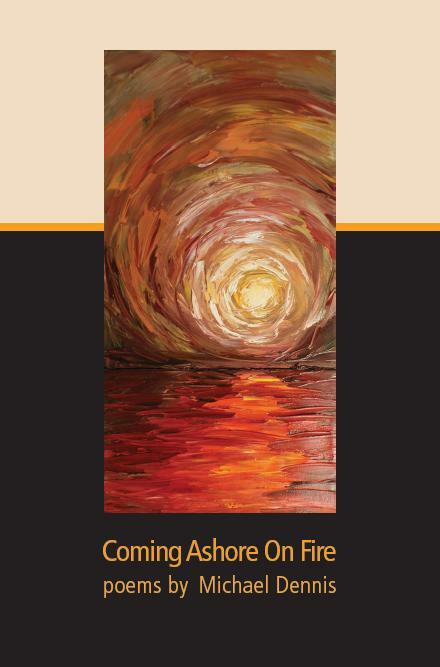 Coming Ashore on Fire is a lengthy collection, with a whopping 106 poems carried across 135 pages. Most are less than a page, and all poems and titles are written in ultra-utilitarian lowercase. Dennis doesn’t bother with meter, rhyme or assonance, and doesn’t pay much attention to sound or performance. Nor does he play with the arrangement of lines on the page, the visual appeal of dynamic traditions, nor the sweat and stress of working through formal constraints (unless, of course, one counts his consistency in diction and tone, in poem after poem, as a constraint in its own right, limiting the range of his voice and subject matter). These are not David Antin’s “talk-poems,” nor are they quite like the work of Purdy or Acorn, nor do they convey the music of Layton. They are intensely realist, stripped-down, first-person confessions. All utterances come from a singular persona; there are no divergent voices or impulses. Dennis’s speaker (or stand-in) is most aligned in style and assurance with Charles Bukowski, but a Bukowski in his most tender and humane moments. Rather than revel in bravado or muscular posturing, or screen his work behind irony and sarcasm, Dennis attempts the increasingly rare feat of plainspoken emotional sincerity, no matter what the cost. Experiencing poetry through the eyes of an uninitiated reader provides a valuable and rare insight into how, and to what success, a poem works. And for my partner, these poems were certainly working. But I felt compelled to ask: was her instantaneous—and admittedly unsophisticated—embrace of the collection a sign of Dennis’s particular talent or rather an indication of the volume’s ultimate shortcomings? The answer lies somewhere between the two extremes, but still … her enthusiastic acceptance of Dennis’s work initially exacerbated my own reservations—reservations about its use of sentimentality and cliché, its ostensible lack of subtlety and complexity, which already threatened my appreciation of some otherwise beautiful and moving pieces. Reviewing Coming Ashore on Fire, I was ripped in two over so many of its basic components. As such, it might be fitting to first list some of my reservations. Backing in to a discussion of why this book is actually a success may seem abrasive, but might allow me to discuss how Dennis surpasses his limitations and often makes gold out of base materials. The poems of Coming Ashore on Fire can be perhaps too neatly divided into four thematic categories: work (its exhaustion, tedium and Sisyphean despair), poetry (with the author outlining various approaches to craft, his role as a public poet and his self-perceived obscurity as an artist), memories of family life and growing up (often recounting sexual abuse at the hands of his uncle, or the falling out with his father) and love (dozens of poems describe his relationship with his wife, Kirsty). Poems that do not easily fit into one of the four slots are in the scant minority, and so, after wading halfway through, I began to feel as though even the hint of variety might prove exciting, or relieving. Conversely, rather than modulate the tone of voice, which may prove counterproductive to Dennis’s cultivated persona, the book might be better served if it were shorter—this would also have the concurrent effect of highlighting some of the better pieces. The collection is also divided, evenly enough, into four sections, but because poems of differing subjects are scattered equally throughout each, it’s not by any organizing principle that I can deduce. I think it’s proper, and not a stodgy sort of conventionality or dogmatism, to distrust sentimentality. The sentimental fails because we’re inured to it; the discerning reader recognizes the sentimental image or phrase as hardened repetition, cliché. In other words, such images or phrases fail to provide that sense of surprise necessary for any urgent emotional response. Lines in this book like “no more rhyme and reason” (“happy birthday to me”), “it was a dark, dark night” (“leaving Ireland”), “the small stuff wouldn’t matter” (“career arc”) or “we are two bugs in the same rug” (“another Kirsty love poem”) really do let these poems down. There’s a difference between being plainspoken and falling into cliché sentiments, and often Dennis litters his work with lines that err on the side of the recycled, or just plain maudlin. What we have here is both fulfillment (as he is literally waiting the entire day for his wife’s return) and contradiction of our expectations. Where another poet may have indulged or furthered the ache of melancholy, Dennis isolates a surprising sense of warmth and appreciation, movingly celebrating the presence of the woman who has restarted his humble, daily life. Here, as in so many other poems, Dennis’s brand of “complexity” proves exactingly subtle; rather than showcase his talents through density, or obscurity, his best poems reach conclusions that force the reader into a renewed investigation of their very purpose. tied insolubly to their wills. I’m for a moment utterly convinced of his aesthetic, embarrassed by anything more coy or posturing, anything with more ambition to burn. And when he writes of how much he adores and owes his happiness to his wife, I can think of no better tribute to a lover. In his love poems, Dennis finds an amazing knack for hitting the deep baritone notes of long-term romance, spelling out his devotion without embellishment or fireworks. Though I’m conflicted when he strikes a false note, I’m utterly convinced when he’s precise, and typically reclaimed (my will once again wrestled from me) when he reaches his conclusions, proving his consummate abilities as a storyteller from start to finish. This book is both marvellous and flawed and, indeed, difficult to assess, perhaps in part due to its total rejection of the status quo. I’m sure most readers will be surprised by its ordinariness, but that’s simply a symptom of our contemporary climate, often most loudly dominated by the most progressive and polemical. Our conceptual or avant-garde poets rail against the lyric, the persona, the emotional appeal; they say language must at all times announce itself as such, and such alone; it must play, be robustly non-referential and never apologize for its obfuscations. But it is this aesthetic that often bullies the contemporary scene—holdovers from L=A=N=G and splintered conceptual schemas, theoretical poetics driven primarily by an intellectual relation to texts. And we read and appreciate such texts, if we are brave, by learning to yearn for difference, to pass from sense into inscrutability and to enjoy the experience. Yet Dennis’s collection dares us to call it poetry, good poetry, relevant poetry, and by daring us to try to do the same. How might one easily imitate Dennis? The task would not be easy, if even possible (“easy to understand” often comes with the weighty price tag of “difficult to execute”), yet the realm of the experimental extends its inclusive hand toward us, allowing our play to sometimes masquerade as discipline. Perhaps my initial unease with my partner’s quick enjoyment of Dennis’s work owes more to my prejudices about the genre than I previously thought. Perhaps what makes us often so skeptical of the “ordinary” in a work like Coming Ashore on Fire is that it denies poetry’s status as special privilege, reserved for the elite few who take the time to deconstruct it; that it opens its borders to the uninitiated, those outside its typical trajectories. Though some of it is marred by cliché or arbitrariness, it nonetheless calls my prejudices, reading habits and assumptions into question, and interrogates my self-erected divisions between sincerity and sentimentality. And because of these demands, this questioning and the realm of thought it thrusts me into, I am forced to treat it with utmost seriousness, and with equal care and attention as any recent avant-garde offering that more loudly announces its arrival into the world. Spencer Gordon just finished an MA in English and Creative Writing from the University of Toronto. He co-founded and co-edits The Puritan, and co-edits Ferno House, a micropress publisher.